While the 2016 U.S. Soccer Development Academy Showcase and Nike International Friendlies are packed full of action on the field, the week also allows for education off the field. Concurrent with the two events, the Development Academy is also hosting one of six sessions for this year's Academy Director license course. 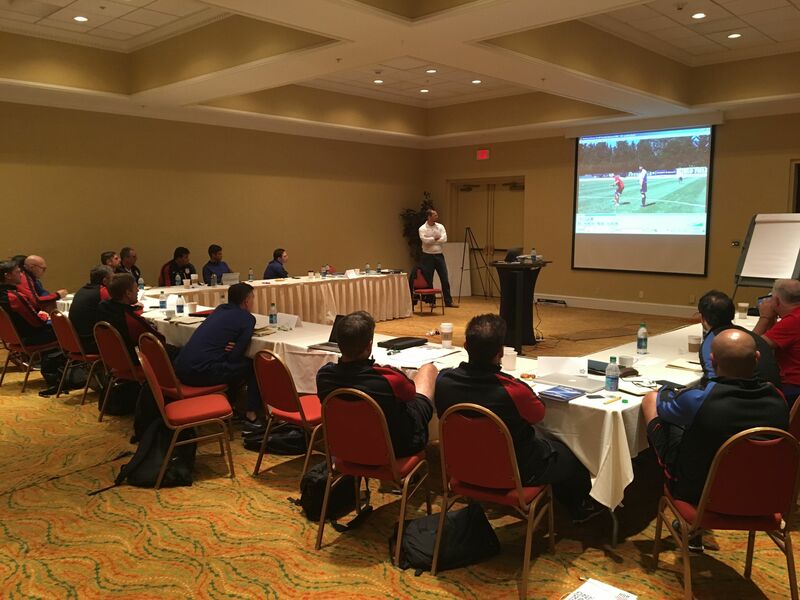 Led by former AZ Alkmaar Academy Director and current U.S. Soccer Coach Educator Aloys Wijnker, the year-long course is built to help Academy Directors in all potential areas with their respective clubs, with a specific focus on leadership of both players and coaches they oversee. "The goal is to improve the level of our Academy Directors," Wijnker told ussoccerda.com. "There are seven main areas for an Academy Director and we try to improve upon all of them. There is a lot of individual development according to individual needs." The areas the year-long course focuses on include club policy, mentoring and leading the coaching staff, innovation, leadership, representation, managing the day-to-day operations and creating a talent development plan for the Academy Club. One of six sessions held throughout the year, this week's module involved a mixture of different lessons from a wide-range of speakers both inside and outside of soccer, allowing the course's 20 participants to gain best practices in their different areas of focus. Among the speakers were a high school principal to speak about mentorship to both teachers and students and a business executive who discussed the ins and outs of running a company. "I think any opportunity to learn from others and get out of your comfort zone and hear through case studies and experts in other fields is beneficial," FC Dallas Academy Director Luchi Gonzalez said. "If I can be a good learner, then that'll help me be a more effective teacher and I want my players and staff that I work with to be good learners." With the current course now in its third iteration, this week's session also brought back previous course participants to work as mentors for the current group as they work towards their Academy Director license. Those mentors should serve as helpful guides as the current crop of students goes through their 14 assignments throughout the year, all leading up to their final presentation next summer. "The course is very intensive," Wjinker said. "It's pass or fail. You can't just show up, sit in the meetings and come away with a certificate at the end. We want to push our Directors so they can develop in their own roles and help further develop their clubs on and off the field." With FC Dallas having won both the U-15/16 and U-17/18 Development Academy National Championships this past summer, Gonzalez feels confident that his club is on the right trajectory, but is also cognizant that the things he's learning now will be continue to improve their growth moving forward. "At our club, we have our way today, but that way also has to evolve because soccer is a moving thing. You have technology that changes, the game gets faster and stronger and you have different levels of investment. Every club is trying to be the best - you can't be stagnant. When I go back, it's more sharing the experience I've had and cooperating with my staff and technical directors to see what can work for us and how we can integrate that."